Scotland's first minister is to make what has been described as an "important" statement on Brexit. It comes amid mounting speculation that Nicola Sturgeon is moving towards calling for a second referendum on Scottish independence. BBC Scotland's political editor Brian Taylor said he did not expect Ms Sturgeon to name a date for a referendum. But he said it would be "at least" a final warning to the UK government. Will there be another vote on Scottish independence? Will the prime minister allow indyref2? He told the BBC's Good Morning Scotland programme: "I think it will be the final warning to the UK government saying to deal with Scotland, deal substantially with Scotland, set out terms for the way Scotland will be treated distinctively, or else. "But I think she will go further than that. I think that she is probably getting, like the rest of us, slightly exasperated by tiptoeing towards the referendum. "And I think it will be the detailed terms as to how and when and where and why a referendum takes place, and I think she will set it out in very precise terms". 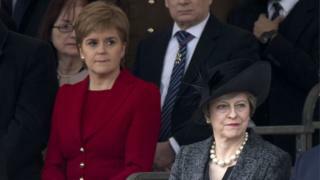 Ms Sturgeon will make her statement at her official Bute House residence in Edinburgh at 11:30 GMT as legislation paving the way for the UK prime minister to begin the formal Brexit negotiations faces its final test in parliament. If the Article 50 Bill triggering the exit from the EU is passed, it could win royal assent as early as Tuesday, allowing Mrs May to begin the two-year Brexit process. Ms Sturgeon has previously hinted that the autumn of 2018 would be a suitable time to call a referendum unless the prime minister accepts a series of demands set out by the Scottish government ahead of the formal triggering of Brexit. The demands include allowing Scotland to remain a member of the European single market even if the rest of the UK leaves. Theresa May has promised to examine the proposals - but has not indicated that she is likely to accept them. Scottish voters rejected independence by 55% to 45% in the referendum in September 2014. The Scottish Parliament currently has a narrow pro-independence majority, with the SNP and Greens in favour and the Conservatives, Labour and Liberal Democrats opposed. If MSPs were to vote to hold a referendum, they would require the permission of Westminster to make it legally binding - but the prime minister has so far avoided saying whether or not she would give consent. However, Labour leader Jeremy Corbyn said at the weekend that he would be "absolutely fine" with a second referendum if Holyrood voted for one, and said it was not the job of Labour "to prevent people holding referenda". His comments sparked a furious reaction from senior Scottish Labour figures, including economy spokeswoman Jackie Baillie and the party's only MP in Scotland, Ian Murray. Speaking to the BBC's Today programme on Monday morning, Mr Corbyn attempted to clarify his remarks. He said: "If the Scottish Parliament decided they wanted to have a referendum then it would be wrong for Westminster to block it. "But let's be absolutely clear, I do not think there should be another referendum, I think that independence would be economically catastrophic for many people in Scotland."